We carry all of your thermal shipping needs. A/B Box Liners. 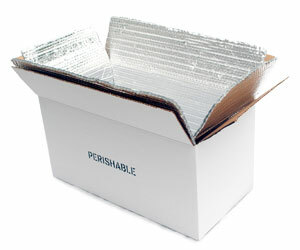 Our foil box liners come as a kit to make 5 thermally shielded shipping containers. The kit contains 5 pairs of foil, and 5 boxes marked "Perishable" in the sizes listed. Part # Length Width Height Set Qty. Price Order Qty.